Ask anyone in the other 49 states to name an Arizona Community and the first city they think of is Scottsdale, and there are plenty of good reasons! Known as “The West’s Most Western Town” because of its quaint Old Town section which is a delight to tourists, Scottsdale has grown, however, into a vibrant community with a high quality life style. Scottsdale’s downtown is one of the finest urban centers in the country with it’s 320 shops, over 90 restaurants and at least 80 art galleries, including The Waterfront, and has one of the largest shopping malls in the country, Fashion Square. But Scottsdale is much more than a tourist mecca, offering attractive homes and neighborhoods sought after by Arizonans. Scottsdale is due east of Phoenix and also borders Paradise Valley and the Sonoran Desert. It’s 230,000 population is spread over 31 miles from its most southern border to the north. Homes generally increase in price the further north one travels. Scottsdale consistently ranks among the best places to live in the nation with its top-ranked schools, beautiful parks, bike paths and trails, and brisk economy. The Scottsdale Sports Complex hosts numerous events throughout the year including competitive bicycle racing. 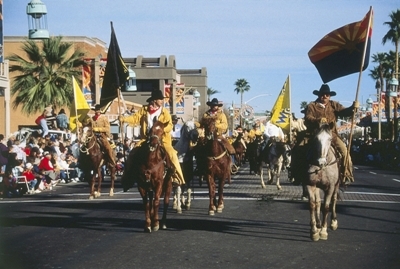 Scottsdale’s Parada del Sol Parade and Rodeo is a favorite yearly event for young and old offering the lure and pageantry of the Old West. The median sale price for the Summer of 2016 is $415,000, with homes selling at approximately $200 per square foot. Scottsdale saw an increase in values of 5.6% over the past year with an estimated increase of about 3% forecast in the next twelve months. The most affordable homes are found in the Southernmost neighborhoods below Camelback Road.